Eccher Gulch is a locals favorite, combining a long, arduous climb with a technical, “gamey” descent. If you’re looking for easy mileage, best to look elsewhere. The remote nature of this trail, combined with the rugged terrain, means that Eccher Gulch is often overgrown and littered with loose rock. This trail also presents a few route-finding challenges, so best to have good knowledge of the terrain before setting off. Eccher Gulch may be accessed via Roaring Judy Road off of Jack’s Cabin Cutoff Road, or along the Cement Mountain Trail via Deadman’s Trail. While climbing Roaring Judy Road may be the steepest climb in the county, heading up Deadman’s to the Cement Mountain Trail is no walk in the park. A quarter mile before Cement Mountain Trail terminates into Roaring Judy Road, Roaring Judy Trail 552 spurs off to the west. This trail is marked with a Forest Service sign a few hundred feet up the trail. After a short climb, riders are treated to the first of two very technical descents. Take caution on an exposed side hill with a few technical rock moves thrown into the mix. If you can remember to stop and look behind you up valley, you will catch a glimpse of a cascading waterfall. 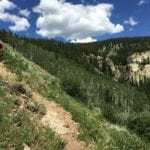 From there, the trail plummets through dense timber and aspen before spilling out into open meadows. Look for the start of Eccher Gulch trail on your right soon after leaving the dense aspen stands. This section can be tricky to find, as the start of Eccher can be hidden in the tall grass. Should you miss the turn, you will find yourself at the bottom of a two track road only a short distance from Roaring Judy Road. The beginning of Eccher is a pleasant contour through dense aspen with a few stout climbs to keep things interesting. Before the final descent there is a short, 15 minute hike a bike before a short pedal that brings you to the saddle between Round and Cement Mountains. From here, the trail drops swiftly through dense pine stands, rewarding your efforts with flowy stretches of trail covered in soft pine needles. The trail eventually turns to steep, rock strewn track before crossing Granite creek and ending abruptly at a hay meadow and wire fence. While there is currently no official exit, walking back up the trail and then heading south across Forest Service land will eventually lead the rider to steep, sage covered hills a short walk down to Highway 135. The last bit of hiking and riding from the private fence takes about 20 minutes, so be aware that the ride isn’t quite over once the descent lets up.